It&’s kiss and make up time in the BJP these days. First, Narendra Modi attempted to make peace with in-house opponent L K Advani by calling on him in a blaze of publicity during a recent trip to Delhi. Modi was in the capital to chair the first meeting of the election campaign committee. Now, it&’s party president Rajnath Singh&’s turn. 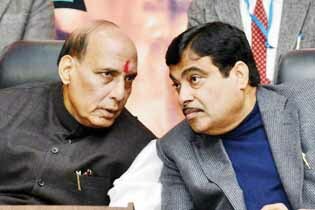 He&’s trying for a patch-up with his predecessor Nitin Gadkari. Singh not only hosted a small private dinner for him a couple of weeks ago, he even cancelled a speaking engagement in his Lok Sabha constituency of Ghaziabad to see off Gadkari before the latter left for Europe some days ago. Singh rushed back to Delhi when he heard that the former party president was in the Capital for a few hours before flying out. He went straight to Gadkari&’s residence. If party sources are to be believed, it was a warm send-off. Relations between the two have been frosty ever since Singh beat Gadkari in a last-minute upset to deny the latter a second innings as BJP president. Riding high on support from RSS joint general secretary Suresh Soni, Singh didn’t bother with his predecessor. But equations have changed. Gadkari is back in reckoning as RSS chief Mohan Bhagwat&’s chosen one. Having successfully resolved the crisis created by Advani&’s resignation drama, he has emerged as an important interlocutor between the RSS and the Advani camp. Singh was conveyed a stern message to engage with Gadkari and not relegate him to the margins by none other than Bhagwat himself. RJD chief Lalu Yadav&’s anxiety levels are sky high these days. The Jharkhand High Court will finally deliver its judgment in the 17-year-old fodder scam case on 15 July. A few days ago, a worried Lalu was spotted offering homage at the Sai Baba temple in Shirdi in a culmination of a temple yatra that has seen him and his family visit all the famous pilgrimage spots in the country ever since his RJD lost power to Nitish Kumar&’s JD-U in Bihar. The 15 July judgment could turn Bihar politics upside down, especially if it goes against Lalu. Although he can always appeal in the Supreme Court against an unfavourable verdict, the fact is that a conviction will make him an untouchable for the Congress, which in any case seems inclined to do a deal with Nitish. Lalu&’s conviction in a corruption case will pave the way for the two parties to cement their unspoken understanding, even it only happens after the Lok Sabha polls. On the other hand, an acquittal could blaze a comeback for him, riding on his recent Maharajganj bypoll victory. No wonder Lalu is looking for divine help. The loser in the recent patch-up between the Congress and the DMK is former telecom minister A Raja. Now that the Congress has rescued DMK boss M Karunanidhi&’s daughter Kanimozhi from parliamentary oblivion to help her win a Rajya Sabha seat, Raja may be forced to hold his 2G fire on Prime Minister Manmohan Singh and finance minister P Chidambaram. Raja has been demanding that he be allowed to depose before the JPC to give his version of events that led to the controversial allocation of 2G Spectrum licenses at cheap rates. His defence has been that both the PM and Chidambaram were in the loop when the decision was taken. The buzz in Congress circles is that Raja&’s silence was one of the conditions set by the party high command for transferring its five votes in the Tamil Nadu Assembly to Kanimozhi so that she squeezes through in an election she would have otherwise lost. It must be a blow to Raja because he was once the blue-eyed boy of Karunanidhi and Kanimozhi. As they say, blood is thicker than water. The development has also given the Congress the cushion of numbers in Parliament. They had lost that comfort when the DMK pulled out of the UPA. The DMK has little choice now but to hold its fire when the monsoon session opens. Every AICC reshuffle sets off a battle for rooms at the overcrowded Congress headquarters on Akbar Road. Now that Ambika Soni has bounced back as general secretary in charge of the powerful Congress president&’s office, she was naturally allotted a room that is considered prime property. It used to be shared by former general secretary Ghulam Nabi Azad and the head of the foreign affairs cell, Karan Singh. They had erected a partition through the middle of the room to ensure they didn’t get in each other&’s way. One of the first things Ambika did on being allotted the room was to remove the partition. The question then was: where would Karan Singh sit? Surely not at the back, in one of the hutment rooms. Realising the predicament facing one of the party&’s most senior and respected leaders, Ambika graciously offered him the use of her room whenever he wished. The agreement is that she will work from home when he wants to use the office for assignments, like receiving foreign dignitaries.